Invoice Simple is the easiest way to send professional invoices and estimates to your customers. It's perfect for small business owners, contractors and freelancers needing a fast, easy to use mobile invoicing solution. 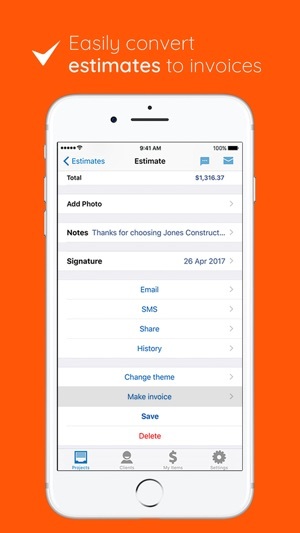 Create, send and track invoices and estimates on your phone and keep your finances organized. Send the invoice before you leave the customer! With Invoice Simple, you can add as much or as little detail as you need. Include payment information, due dates, photos, discounts, shipping details, signatures, and more. Deliver via email, text or print. You can even get notified when the customer reads your invoice. Get paid via credit card, online payments, cash, check, PayPal, and more. 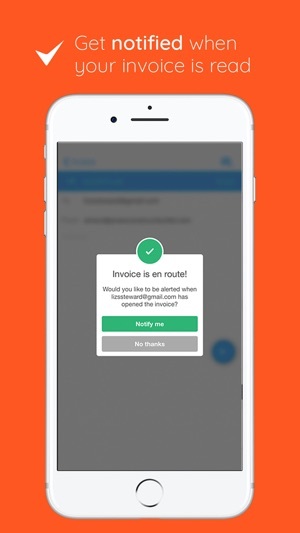 * Create invoices and estimates wherever you are—with a customer, between jobs, or at home. Make your invoices look as professional as your business. Modern and customizable. Get invoicing right away. Hands-down the easiest invoicing app available. Manage all your business finances in one place. Make doing your taxes a breeze. Email, text or print your invoice as soon as you finish a job. Make it easy to get paid. Accept cards in-person or online, as well as checks and cash. Invoice Simple is used by hundreds of thousands of small business owners like you and is consistently rated one of the top invoice apps. 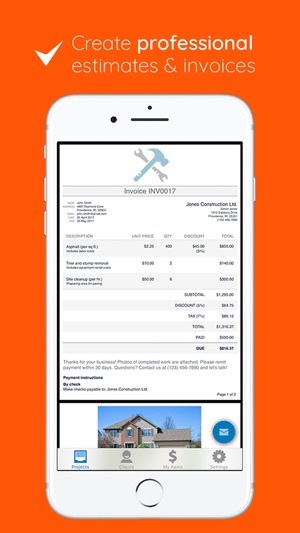 Invoice simple the ultimate invoice maker: Send simple invoices using professional templates, invoice generator, PDF invoices and quotes, online payments, bill organizer, receipt and expense tracking, and business reporting — all rolled up into one easy-to-use app. Whether you need to create a construction invoice or quote, business receipt for your side gig or track receipts for your small business. Ready to get started? 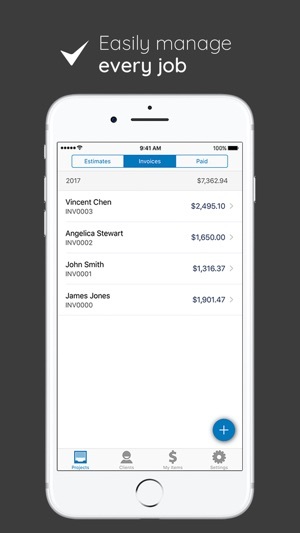 The free version of Invoice Simple is available on iPhone, iPad, and iPod Touch and can be used to create 3 free invoices or estimates on your mobile device. You can upgrade in-app to create an unlimited number of invoices and estimates with a monthly or annual subscription. A monthly subscription starts at $5.99 USD per month for unlimited invoices on your mobile device. An annual subscription starts at $59.99 USD per year for unlimited invoices on your mobile device. Subscriptions automatically renew and your credit card will be charged through your iTunes account. You can turn off auto-renewal at any time from your iTunes account settings. Your subscription automatically renews unless auto-renew is turned off at least 24 hours before the end of the current period. No cancellation of the current subscription is allowed during an active subscription period. Any unused portion of a free trial period, if offered, will be forfeited when the user purchases a subscription to that publication, where applicable. I just came across this app for the first time, and already love it. It creates beautifully detailed and organized invoices I can send to my design clients. Along with the detailed invoices, listing merchandise I’ve purchased for my clients, I can also attach photos of their decor, furniture, and copies of any store receipts, and etc. and all of it is attached to the same invoice as a single document. This will save me SO much time! Plus, I can do it all from my phone, without having to sit down at my computer, which is SO nice. Once I entered the detailed info, I was able to email/text the invoice to my design clients for them to immediately view. 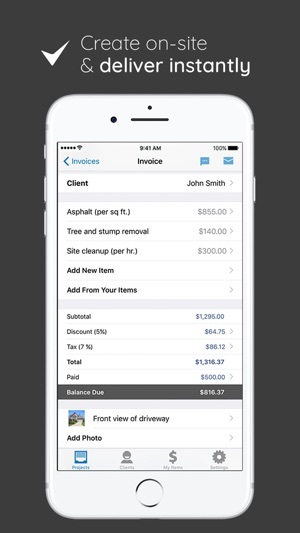 The app then lets you know once your clients have viewed the invoice, which is also a nice feature. The developer even sent me an email after I first used it to see what else I would recommend adding to make the App more user friendly. I’ve never had a developer reach out before. Thought it was pretty cool. Thank you for developing this app! So lucky to have found it! This is the first app I've ever bought. That's how awesome it is. Typically I don't buy apps since they are difficult or I can't see myself getting my money's worth out of it. That all changed with this app. Being a consultant and small business owner I do a lot of invoicing and billing to clients. They are typically very confused and can't understand the costs. However, with this, it is easy to read, well laid out, and sooo easy to prepare. The ability to text it or email is a life saver for those who have smartphones now. All I can say is if you write invoices periodically, you need to get this! Only down side is you can't shuffle or move the new items around once you've typed them in. They need to be in order as you type them. If there is ever an update I would love to see that feature just in case I got something out of order so I don't have to erase things. Other than that, it is perfect and a must have!! I love this app. It does exactly what I need it to do and it’s relatively cheap. It’s super simple to use and has many great and useful features. One of the biggest downsides is that it’s relatively expensive to use their “online payment” options. It charges 2.9% plus .30 cents for each transaction. Therefore if you are using the app for a construction business where thousands of dollars are moved around that adds up to a pretty hefty fee. I would be fine paying even $20 a month of the client’s online payment option was free. What I would like to see changed, is that once an estimate been turned into an invoice for the signature line to change to invoice. As of right now it transfers the “note” from an estimate to invoice so you have to correct that manually. Also would be nice if estimates once turned into invoice would disappear from the estimates tab-which indicates active projects.